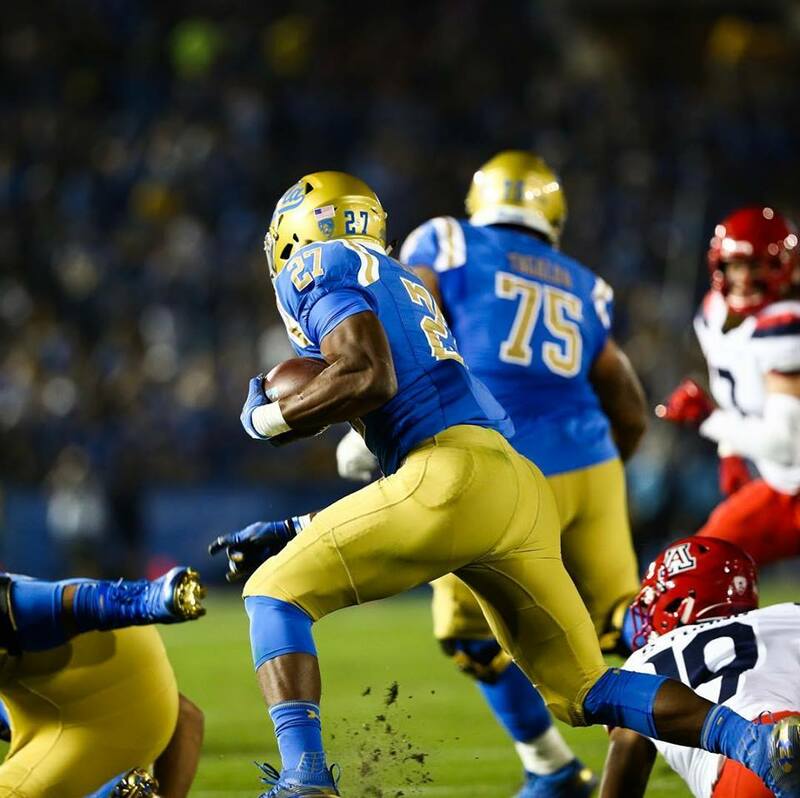 UCLA managed to edge out the win over Arizona, 31-30. PASADENA—The UCLA Bruins notched their second consecutive victory, first at the Rose Bowl, defeating the visiting Arizona Wildcats, 31 to 30 on Saturday, October 20. Bruins backup Quarterback Wilson Speight, replaced injured QB Dorian Thompson-Robinson in the second quarter. Speight threw for two touchdowns, leading the Bruins to this crucial victory. The Bruins record is (2-5, 2-2 PAC-12). The battle of the night was at running back, where both stars turned in an outstanding performance. Bruins RB Josh Kelley scorched the Wildcats defense for 136 yards on the ground. Kelley has had four straight games rushing for more than 100 yards. His 28-yard TD run early in the fourth quarter gave UCLA the lead for good. While Arizona’s J.J. Taylor was magnificent, bursting through gaping holes with tremendous velocity to the tune of 156 yards. His fatal error was having the ball stripped inches from the end zone. The ball was jarred loose by Bruins Safety, Darnay Holmes, who fell on the ball for a touchback. It was the play of the night. UCLA scored a touchdown on their opening drive. This is the first time the Bruins scored a TD on their first possession in 2018. Despite their five-game slide to kick off the Chip Kelly era, these Bruins amazingly have a shot at winning the PAC-12 South division, where every team has at least two losses. The Wildcats trailed 17-7 at halftime, Arizona spearheaded an inspired comeback. Pouncing on the doe eyed Bruins, briefly holding a narrow 24-20 lead. The Bruins promptly scored a TD in the following drive, that’s where the team’s defense made a stand. With 7 minutes left, Arizona faced a critical 4th down near the Bruins end zone. Wildcats coach, Kevin Summlin elected for the field goal rather than rolling the dice on fourth down. Frankly, it was the wrong decision to settle for the field goal. The Bruins salted the clock, converting on multiple third downs. Coach Kelly needs to insert Wilson Speight as starting QB for the remainder of the season. His accuracy, poise in the pocket and his leadership have earned him the right to be under center. No offense to Thompson Robinson whatsoever. In the future, he will be terrific. However, Speight has 16 starts under his belt for the Michigan Wolverines. This graduate transfer deserves an opportunity to start, and to prove himself to the Bruin faithful. The Bruins welcome the Utah Utes for a special game on Friday, October 26 at the Rose Bowl. Kickoff is at 7:00 p.m.